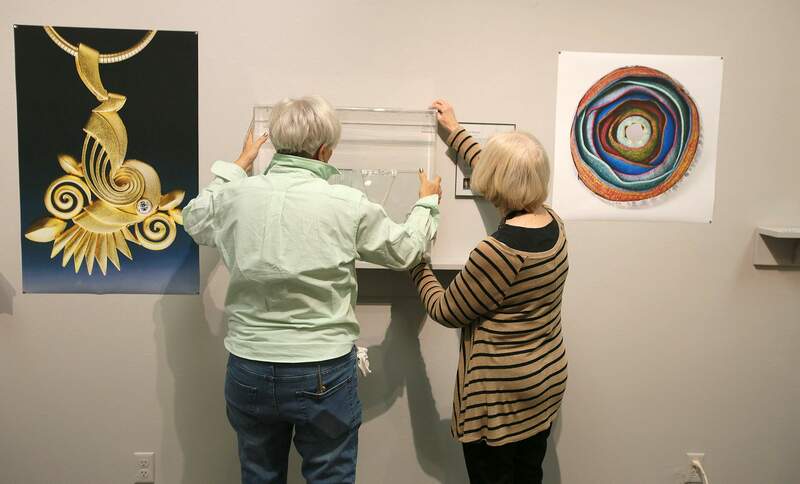 Diane Welle, left, and Regina Hogan rush to arrange a display of jewelry during preparations for the Durango Arts Center TOP Jewels –National Jewelry Design Exhibition featuring almost 150 works from 73 artists throughout the country. 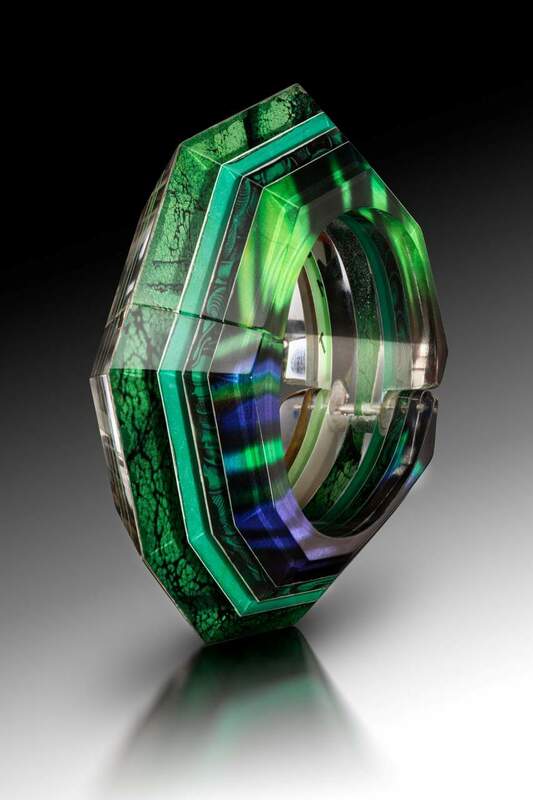 The show opens today, and the winners will be announced at DAC during an inaugural reception that goes from 5 to 7 p.m.
Minnesota jeweler Jennifer Merchant’s “Kryptonite Hinged Bracelet” is made of acrylic, magazine paper, rare-earth magnets and sterling silver. Wendy’s McAllister’s “Lava” is made of vitreous enamel, copper and oxidized silver. 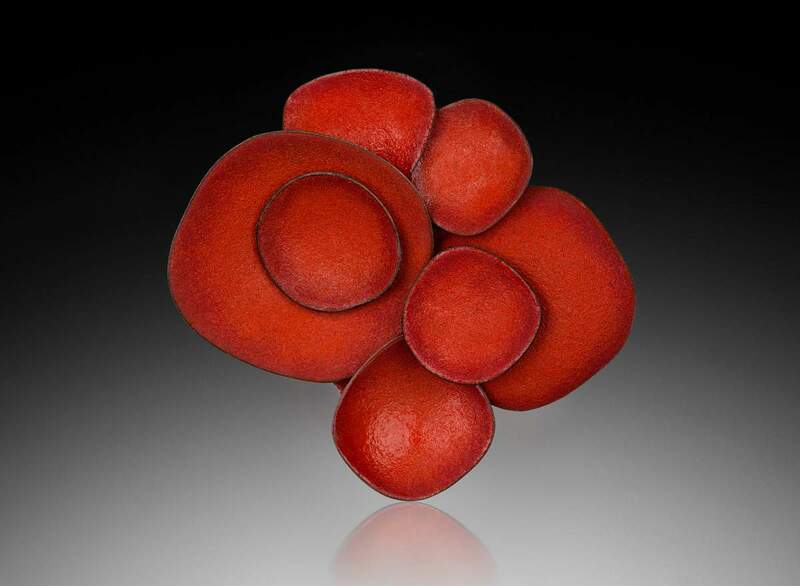 Jewelry created by Laura Elizabeth Mullen of St. Louis is on display in the Barbara Conrad Art Gallery at the Durango Arts Center as part of the TOP Jewelry Show that opens today. The show features another necklace by Mullen that’s constructed with metal medical implants, of the type used in hip replacements. Starting today, Durango residents can ogle 150 minor masterworks of jewel-smithing at Durango Arts Center, thanks to the debut of TOP Jewels – National Jewelry Design Exhibition. The finery on display is startling: The pearls glisten, the gold glows, the silver shines, the gems mesmerize. The juried show took more than 18 months to organize, with artists from all over the country submitting nearly 500 pieces for consideration. Renowned local jewelry designers Susan and Jeff Wise winnowed down the entries to the 144 finalists by 73 artists now on display. Then, on Thursday, the big guns arrived: Allison Buchsbaum Barnett, co-owner of the Patina Gallery in Santa Fe, chose eight winners among the finalists. They’ll be announced tonight at DAC; altogether, they’ll take home $5,000 in prize money. That won’t be the last time money changes hands during the six-week jewelry exhibit, where the pieces on display range from $125 to – much more. Durango Arts Center was coy about how much it is asking for upper-end pieces, citing concerns about security. But from reports in currency around town, potential buyers may want to evaluate whether some of the gorgeous baubles showcased at DAC really are worth a year of their daughter’s tuition at Yale University. Exhibition judge Jeff Wise said since the first caveman bestowed pleasant-looking rocks on his cavewoman beau, humans have festooned themselves in jewelry. “Life is too short to be boring. To use your body as a piece of art and decorate it – humans are all about adornment. We are hard-wired that way,” he said. Even in our more mobile society, jewelry serves as a formidable shorthand for social class, with Barbara Bush’s pearls declaring her WASPy credentials while Miley Cyrus’ gold and diamond grill declares – perhaps less persuasively – her affiliation with hip-hop royalty. But no one visiting the arts center show should expect wan imitations of Tiffany’s sterling silver hearts or obsequious replicas of Kate Middleton’s diamond-and-sapphire engagement ring. Instead, they should expect ingenious, challenging and droll creations like those of Megan Clark: At first glance, her chandelier necklace – ostentatious, imposing and grand – seems like a disciplined riff on art deco, expensive precious metals encasing even more expensive black onyx stone. 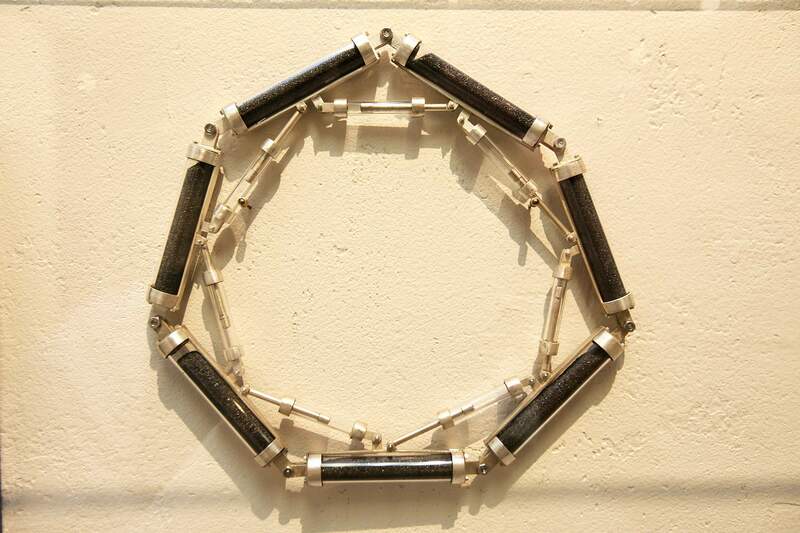 Then you read the artist’s intention: It’s inlaid with stingray leather, not onyx stones. Walking through the exhibition, there’s one work – a large broach or pin – by Laura Elizabeth Mullen of St. Louis. It looks like what might have happened if a tiny elf constructed a tiny industrial engine and drunkenly placed pearls where the machine’s pistons ought to have gone. The workmanship is outstanding, but the piece’s intellectual impact depends on contrast, as Mullen seamlessly, mischievously interweaves gold, silver and diamonds with Plexiglass, rubber and steel. Mullen’s work is careful and self-effacing. Elsewhere in the exhibit, broaches, pendants, lariats, bracelets and earrings evince a flair for the dramatic that would please Elizabeth Taylor, who collected jewelry more avidly than she collected husbands. Yet almost every artist displayed is united in smuggling witticisms into their jewelry, some acerbic, others sly. For instance, a viewer confronted by Aric Verrastro’s delightful pink cushioned pin – which is vaguely shaped like an amoeba – might not immediately grasp that Verrastro is exploring “the blur between gender roles, while searching for equality in unexpected places,” nor notice that the work is immaculately threaded with fake-eyelash hairs. Consult the artist’s statement, however, and you’ll learn the pin actually represents sea slugs: “Marine mollusks that are neither male nor female. There are more than 3,000 known species ranging in scale, extravagant patterns and vibrant colors inhabiting the entire world. It is because of these inherent qualities that I have made these sea slugs into my Gender Equality Mascots,” or his gems. Other works deliver more unsettling punch lines. Holland Houdek, currently an adjunct professor in the department of Jewelry and Metal working at Syracuse University, has several works in the exhibition, including one brutal, long and unnervingly sexual metal necklace. At once, it summons the muted grace of Georg Jensen’s cutlery and the lurid, blood-curdling bodily insights of medieval torture devices. In fact, the necklace is comprised by medical implants that are routinely inserted into human bodies during surgeries like hip-joint replacements. “Isn’t it beautiful?” asked Hogan, awed anew at Houdek’s mastery. Within a banal realm of medical technology, Houdek’s necklace isolates a powerful, mortal impulse, transforming its parts – terrifying and utilitarian, made of cold metal and indigenous to hospital operating rooms – into something stark, sumptuous and life-giving. TOP Jewels - National Jewelry Design Exhibition will be on display at the Durango Arts Center, 802 East Second Ave., through June 28. In addition, a lecture and exhibit featuring Yazzie Johnson and Gail Bird presenting a historical overview of Southwest Indian jewelry will be held at 7 p.m. May 31. Other workshops led by Deb Karash on June 14-15 and by Tim McCreight on June 21-22 will be offered.